Check out the new 2019 Honda CR-V and enjoy its many trim levels in New York and New Jersey. Check out the CR-V and explore its Honda Safety Sense systems. You deserve an updated SUV that has 190-horsepower, Real Time All-Wheel Drive, 60/40 Split Rear Fold-Flat Seating, and a power tailgate. Choose the SUV with a turbocharged engine and enjoy your new Honda model. For 2019, the new CR-V LX comes with LED Daytime Running Lights, Multi-Angle Rearview Camera, and 17-inch Alloy Wheels. The CR-V EX also comes with all of the features mentioned above, as well as Smart Entry with Walk Away Auto-Lock and a 7-inch Display Audio Touch-Screen. The new 2019 Honda CR-V comes with a Display Audio Touch-Screen which allows you to access your favorite applications. There's also a Driver Attention Monitor, which ensures that you never lose focus. The Electric Parking Brake is also a notable feature, which makes it easy for you to park on hills. If you're looking to purchase peace of mind, you've come to the right place. The new Honda CR-V comes with tons of intuitive safety systems such as Road Departure Mitigation System, Lane Keeping Assist, and Adaptive Cruise Control. The Adaptive Cruise Control comes with Low-Speed Follow, which is perfect for drivers dealing with stop-and-go traffic. If you live in a busy city in New York, you're going to want a vehicle like the CR-V keeping tabs on the road for you. If you're excited about the CR-V, you'll be glad to know that it only gets better as you climb the trims. The CR-V EX-L comes with Rain-Sensing Windshield Wipers and a Hands-Free Access Power Tailgate, which are both convenient features. 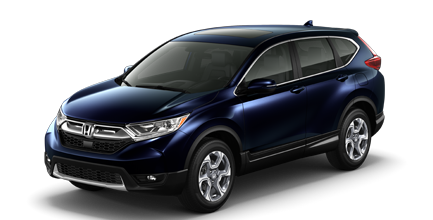 To learn more about the features and benefits that come with the CR-V, contact our Honda Auto Group today. Shop with our team and learn about all of the different CR-V trims we have available. You'll be glad to find that we offer a great selection of well-priced SUVs like the CR-V on-site and online. Visit our dealerships in New York or New Jersey today!